The question I am asked most often is "How do I finish the edges of my quilt?" And the second question usually is "Do I have to do it by hand?" I am offering one-day workshop where you will learn all the answers to these questions (and MORE)! 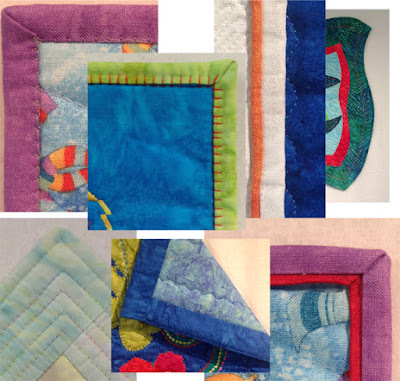 You will finish the edges of sample-size quilts using 6 different methods. These will be reference samples that you will refer to again and again as you select the best option for finishing the edges for your quilts. What you choose for a traditional quilt is different from the common ways for art quilts. You will learn about finishing methods for ALL types of quilts - both hand and machine sewn finishes. Here are a few 'edges' of my quilts showing the wide variety of edge finishing methods you will try in class. You can sign up for this class at Kaleidoscope Quilt Company in Mill Bay on April 9. Class runs from 10 am - 3 pm. If you aren't in the local area and can't attend this class I would be happy to travel to your shop or guild to present this class (and any of my other workshops). Details about the Workshops I offer are here and my current Schedule is here.